If you know John Berryhill or if you follow him on Twitter, you know that he is an avid bicyclist. He rides his bike regularly, including long rides during various domain industry conferences. A couple of years ago, I suggested he ride the Pan-Mass Challenge with me, and he took me up on this great two-day ride to raise funds for Dana-Farber Cancer Institute. John has a unique and fun way to raise funds for his ride. John will offer a reward of a consultation on a UDRP defense and will prepare a UDRP Response if that defense is viable to (a) the first contributor who donates a minimum of $5,000 or (b) the top contributor who donates over $1000 to the Dana-Farber Cancer Institute via John’s PMC fundraising page if the $5,000 reward is unclaimed at the time of the ride starts on August 5. This reward can also be designated by the qualifying contributor for John to defend a UDRP respondent who is unable to afford a defense. I think John is one of the best domain name industry attorneys. There are many UDRP cases I could point to as evidence, but in the last couple of weeks alone, John won the Novelist.com UDRP (with a finding of Reverse Domain Name Hijacking) and he also won the Gstaad.com UDRP. I think it is very cool that John is making this offer on a UDRP defense. You can use it for one of your own domain names or to defend the domain name of a respondent who should not deserve to lose because they cannot mount an effective defense. If you are considering the $5,000 reward, you need to contact John directly to discuss your case prior to making the donation, although of course you are welcome to contribute to his fundraising effort aside from this offer. As with any legal service offering, this offer is subject to a conflict check, there is no guarantee of a successful outcome, the determination of whether a defense is viable is subject to John’s independent professional judgment, and this reward has no cash or equivalent value. 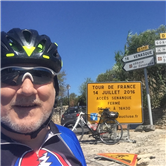 Here is John’s Pan-Mass Challenge fundraising page! The takeaway from this post is that being an intellectual and/or trademark attorney pays well. As an aside, you CAN defend your domain holdings without a law degree or assistance of a third party. If you are in the right, you are in the right. Winning is assured. Responding to Random Domainer: As an attorney, digital marketer, and being familiar with UDRPs, that information is completely wrong. Lot’s of people who are in the right end up losing…and a big reason for that could be because being in the right is very subjective. The challenging party may also think he’s in the right. When it comes to legal issues, it’s always better to have an attorney. Lol. We all have our own opinion. As always, when taking advice, the smartest thing to do is see who it is that is giving the advice and whether they have a vest interest in disseminating that advice. Or as someone else said, never take advice from someone who’s trying to sell you something. The top prize has been claimed! John and I are both still fund-raising and would appreciate additional support.